PrinsBank was established in 1916 to serve the needs of our local communities. We offer a variety of banking products and services. We are proud of our ability to provide full-service banking with prompt, local decision making from people who know you. 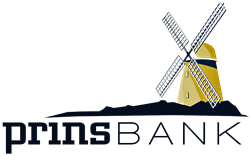 PrinsBank strives to make our customer's banking experiences easy and pleasant. Our friendly and experienced staff is highly committed to service and customer satisfaction. PrinsBank strongly supports the communities we serve. We are committed to assisting our schools, churches and other local organizations. If you are presently our customer, please know that the Board of Directors and the PrinsBank employees value your business and wish to thank you for putting your trust in us. If we can assist you with any additional services, please contact us. If you are not presently banking here at PrinsBank, we invite you to consider our services. If there is something that we can do to make your banking experience better, please call or come by and give us the opportunity to tailor our services around your financial needs. Our goal at PrinsBank is to combine friendly, hometown banking with a wide array of products and services to satisfy our customer’s needs.